Santa is arguably a hipster already. He rocks a red vintage two-piece and an impressive white beard, but now that his image has been regurgitated and mass-produced across all forms of popular culture it may be time to step away from his mainstream look. The designers at Christmas Connections have created an image of how Santa would look if he was a hipster. Firstly, he needs to loose a few pounds. If Santa was a hipster he would probably be vegan so no more mince pies (unless they’re made with soy margarine). We all love a good beard, but in this case Santa needs a trip to the barber for a more sculpted handlebar moustache and goatee beard. When it comes to clothes, his hat would be swapped for a beanie, which would cover his freshly coiffured undercut, and his two-piece would be replaced with V-neck t-shirt, tartan shirt and cut off skinny jeans, finished off with a pair of good sturdy Docs. No hipster would be complete without the right accessories. Santa would upgrade his specs for some thick black rim glasses, and he would also have some body modifications such as ear stretchers and a couple of strategically placed tattoos. Santa still has a job to do, delivering hand crafted presents from his handy manbag, but it’s thirsty work. In order to take the edge off, he samples the delights of some organic mulled wine. 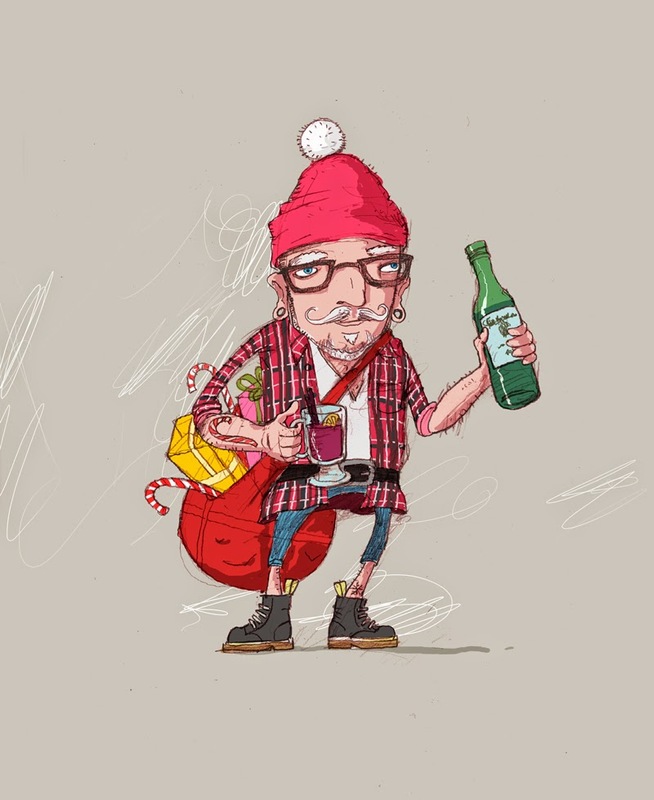 If Santa was a hipster, he could keep this look all year round.